When someone constantly worries what other people think of them this usually denotes a lack of confidence. It can happen if your client's confidence has been shattered or it may be a problem they have always had but never felt the urge to do anything about. 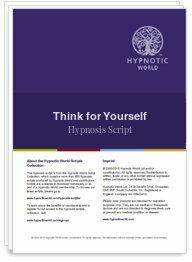 This Think for Yourself hypnosis script from Hypnotic World will help your clients to develop their own thoughts and opinions instead of being reliant on others. The script uses a series of guided visualisations and future pacing to help clients develop their own thought processes and increase their confidence and self-belief.